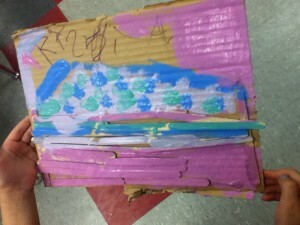 The children have shown an interest in learning about dinosaurs so my ECE partner and I decided to enhance the idea by making an attractive centre. 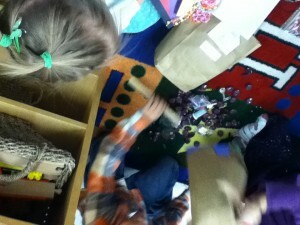 We used table cloths for water and land, we added wood pieces for children to do as they wish, and dinosaurs. Children brought over the books that illustrated where they lived, some wrote the dinosaur names referenced in the books and I displayed their writing next to the table, and words that describe some new knowledge about dinosaurs are also posted. The display is on our sandbox table which we decided to switch over for the week. Simple, easy, and has sparked some new learning on the topic! Next we will change the sandbox into a Paleontologist work site. We have bones from a left over turkey, some brushes, name tags and some fun dinosaur hats they can wear to begin their research in the sand!